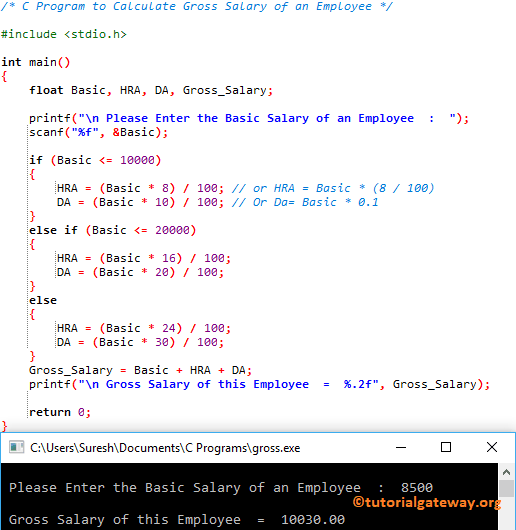 In this article, we will show you, How to write a C Program to Calculate Gross Salary of an Employee with an example using Else If Statement. This program helps the user to enter any basic salary of an Employee and then calculate the total salary in C.
This program allows the user to enter the Basic Salary, HRA percentage, and DA percentage. By using those values, this C Program to Calculate Gross Salary of an Employee or calculate the total salary of an employee. This program is same as above but this time we are asking the user to enter Basic Salary, HRA Amount, and DA Amount.